Trachiniae, like the Odyssey or Aeschylus’ Agamemnon, is a story of nostos: its central action is the return of the hero Heracles to his wife Deaneira and his children in Trachis. 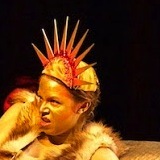 Yet for the first three-quarters of the play Heracles does not appear, and Deaneira dominates the stage. The longest speaking role in Sophocles, Deaneira is a woman of remarkable sensitivity. She begins in a state of anxiety and vague hope, wishing for sure news of her husband. When she learns that Heracles is in love with another woman, Iole, for whose sake he has sacked an entire city, she assumes an attitude of wisdom and acceptance: “Whoever stands up to Eros like a boxer is a fool; for he rules even the gods just as he pleases, and he rules me; how should he not rule another woman like me?” In the next scene, however, Deaneira cannot bear the prospect of sharing her bed with Iole, imagining the two women “waiting under a single blanket for him to embrace.” In her distress, jealousy, and shame, she settles on a desperate plan. She will prepare a robe for Heracles, anointed with what she believes to be a love charm, given to her long ago by the Centaur Nessus. But the potion turns out to be a poison, the dying Centaur’s last revenge. When Heracles puts on the robe, it clings to his flesh, devours his limbs, tears at his bones, feeds on him like a serpent. In metaphors of the beasts he has conquered, the robe lays low the civilizing hero of man. The play begins in darkness. The stage design (by Ashley Simone and Ashley Setzler) is minimal, with the studied asymmetry of a Japanese garden: the façade of a palace on one side of the stage, a stand of saplings on the other. Deaneira (Elizabeth Heintges) emerges from the palace, carrying a lantern. She is dressed in white and silver, with a headdress that gleams like the full moon above her pale face. She speaks slowly, as if in a dream. 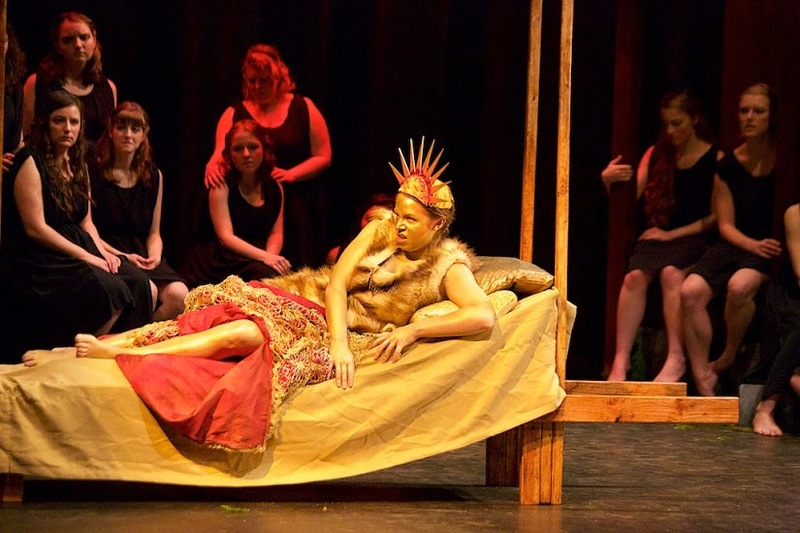 In a monologue she describes her marriage to Heracles and her unease at his long absence. While Deaneira speaks, another actress, identically costumed, enters from the grove of trees. Then a third enters, this time from the palace. What is happening? Conser has cast three different actresses in the part of Deaneira. This bold choice has the practical benefit of dividing up a large number of lines, which might be too much for any one performer. On an interpretive level, Conser’s tripartite casting emphasizes the different sides of this complex and sympathetic woman. Heintges’ Deaineira is inscrutable, speaking to herself more than to the audience. Elizabeth McNamara, who plays Deaneira in the long First Episode, perfectly captures both the regal bearing and the deep compassion of the character. McNamara makes believable Deaneira’s rational words about the ineluctable power of Eros; she will not fault Heracles for his affairs. The third Deaneira is Barbara Edith Vinck, who in two successive scenes describes the plot of the robe and its disastrous miscarriage. Vinck is more distraught than her predecessors, more vulnerable, and therefore more dangerous. When she reports the last instructions of Nessus, she stands transfixed, as though possessed by the ghostly presence of the Centaur; his words revealed, she shakes herself out of the trance with an embarrassed giggle. We get the sense that there are layers to this woman’s consciousness, or perhaps that her mind is like a set of nesting boxes; some, like the bronze box where she stored the potion for so many years, she cannot, or will not, look into. Vinck’s Deaneira seems desperate enough to turn, against her better judgment, to love spells and charms. Does she know, on some level, that the potion given to her by a dying enemy, steeped in the blood of the Hydra, must be evil? Vinck makes us think that she does, and that her silence in the face of her son’s accusations is a partial acknowledgment of her guilt. Deaneira’s suicide is not enacted before the audience. We hear of the queen’s death through a messenger, her Nurse (the breathtaking Rachel Herzog). The Nurse relates how Deaneira bade farewell to her servants, her house, the bed she shared with Heracles, all the details of her domestic life. As she speaks, the Nurse is joined by a dancer (Chloe Hawkey) in a white dress. Slowly, elegiacally, the dancer enacts Deaneira’s last moments; but when Deaneira prepares to plunge a sword beneath her heart, the dancer stops, turns, and walks offstage. Deaneira’s death remains private, personal, silent, beyond our ability to understand. In the first three-quarters of the play the speeches of the Deaneira are set against the songs of the Chorus. 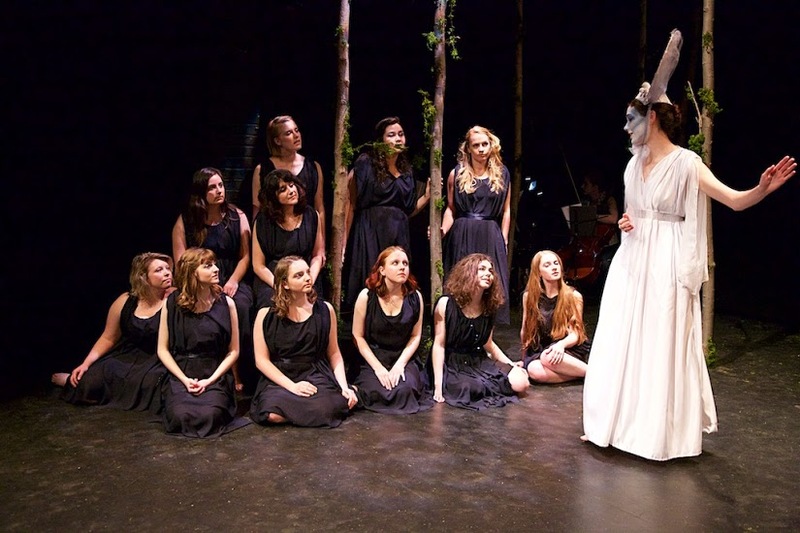 The Chorus, unmarried maidens of Trachis, express a different perspective on the twists and turns of man’s life. They do not share the knowledge that Deaneira has gained through painful experience. What they offer instead is the timeless wisdom of myth and metaphor. 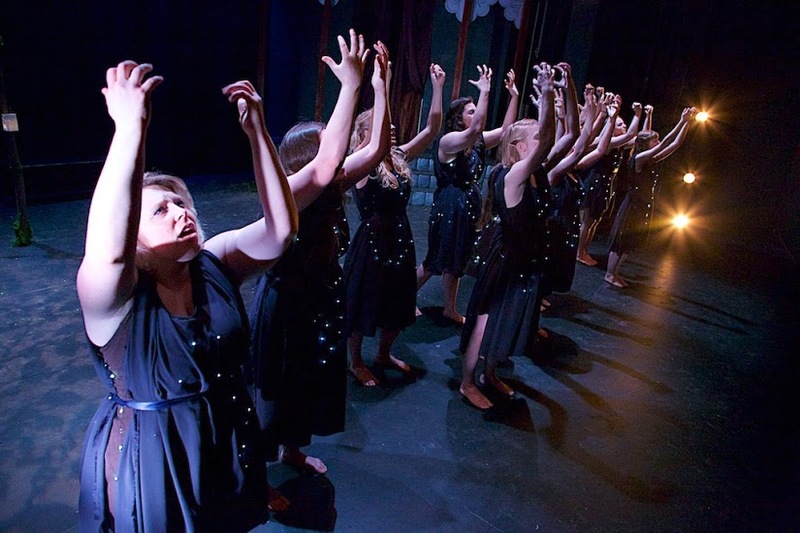 The eleven young women of Conser’s Chorus, dressed in deep blue dresses spangled with stars, whirl in concentric circles, separate, and come together, like the celestial bodies of their first song. They are serene, and the music underscores their serenity: their voices glide in harmony, for the most part chromatically, over an arrangement of keyboard, cello, oboe, ukulele, and percussion. Composer Melody Loveless, who knows no Greek, worked closely with Conser to set the odes with admirable fidelity to the intricate and varied meters of Greek tragedy. The result belies the carping of scholars who say that we can never know anything about how ancient music sounded. We can, and it’s beautiful. The songs of the Chorus, harmonious in sound as well as content, emphasize the cycles of endless return that govern the natural world; their perspective stands in contrast to the more teleological concept of time articulated by Deaneira, who sees event follow event in a relentless chain of cause and effect. Is she deceived in thinking that her life moves from beginning to end, from joy to sorrow? Or can mortal existence, as the Chorus posit, be somehow strophic? The entrance of Heracles, long anticipated and long delayed, is the most dramatic return of all, for the role is taken by Elizabeth Heintges, who spoke Deaneira’s lines in the Prologue. This doubling is consistent with ancient practice: given the constraints imposed by the Great Dionysia, which allocated three actors to each playwright, Deaneira and Heracles must have been played by the same performer. Of course, in the original production the actor would have been masked, and would have delivered his lines in an outdoor theater seating several thousand spectators; we may only guess at the impact of the double casting on an audience accustomed to this convention. The effect in Conser’s production goes far beyond historical accuracy. The doubling is uncanny – not only is Heracles a woman, but he is, in fact, Deaneira. Heracles’ entrance is remarkable also for ushering in a new mode: solo song. 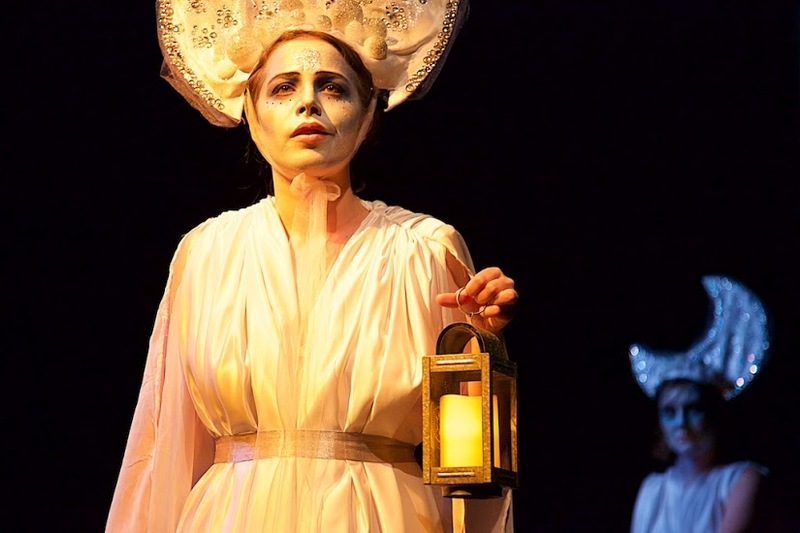 Thus far – after nearly a thousand lines of Greek and more than an hour of performance time – all of the music in the play has come from the Chorus. Heracles, collapsed in exhaustion after his struggle with the robe, is carried in on a bier. His first address – to his immortal father Zeus – is suddenly, unexpectedly, in song. Conser and Loveless here take advantage of Heintges’ musical ability and the range of her voice. Heracles condemns his fellow Greeks and his perfidious wife in a steady, commanding contralto; but when he begs Hades to lull him to sleep, to death, Heintges strains towards a soprano range. It is as if the masculine and the feminine, the strong and the weak, contending so fiercely within Heracles, can only break free through this hybrid song. Aristotle dismissed opsis, spectacle, as the least important aspect of tragedy. That is certainly not the case in this production: the visual aspects of the play, like casting, choreography, and music, are essential to conveying the central themes of time and change. The striking makeup (by Kerry Joyce) and costumes (by Bo Yeon Jang) pick up the astral imagery of the Chorus’ first song in their use of palette: Heracles is a bright vision in gold, orange, and red, symbolizing both the sun and the burning effect of the robe, while Deaneira gleams in silver and white. The three Deaneiras differ only in their headdresses, which represent different phases of the moon. The moon is a symbol of change; it is tied to a woman’s reproductive cycle; and it does not shine by its own light, but reflects that of the sun. Over the course of the play Deaneira wanes and disappears, to be outshone by the glorious Heracles; but when his light has set in death, the moon returns. 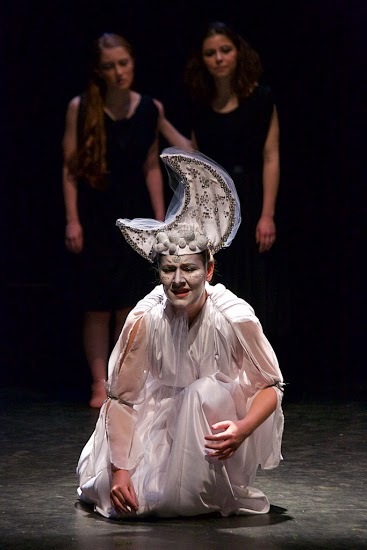 In the final scene of the play Iole, another frightened and unwilling bride, steps out of the palace, wearing the headdress of the full moon. To return to the first stasimon of the Chorus: soon another man encounters joy and sorrow. A few words remain to be said about the quality of the Greek in this production. 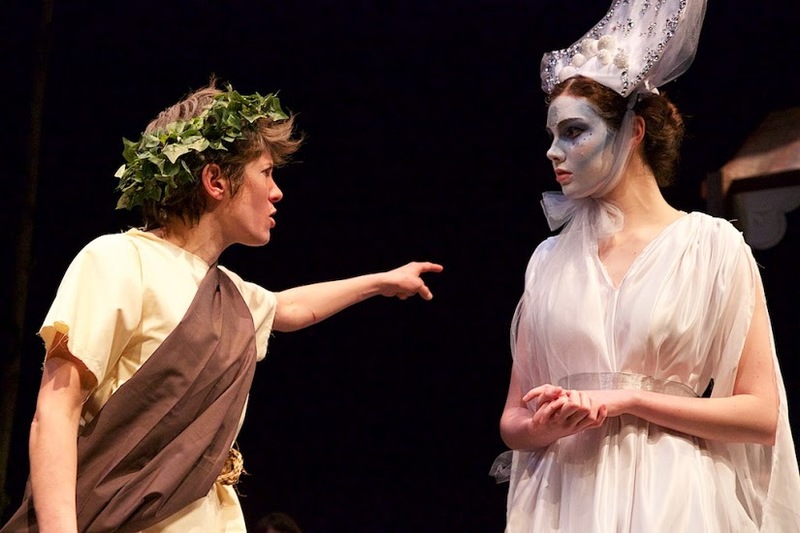 The annual performances by the Columbia/Barnard Ancient Drama Club remain one of the only opportunities in the country to watch the works of Aeschylus, Sophocles, Euripides, Plautus, Terrence, and Seneca (as well as other ancient works adapted for the modern stage) in their original languages. It is a magical experience. A spectator with intermediate fluency in Ancient Greek and some knowledge of the play can follow, at speed, the unfolding of Sophocles’ verses. 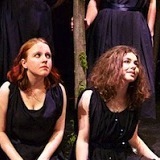 Many of the actors in Trachiniae are seasoned veterans from previous years: in particular, Talia Varonos-Pavlopoulos as the First Messenger delivers her lines with spirit and humor, while Rachel Herzog as the Nurse modulates gracefully from grief to wonder to acceptance in her report of Deaneira’s death. A degree of freedom apparently has been granted the individual performers in their pronunciation of the Greek; given the lack of absolute certainty as to how the ancients mayhave spoken or sung the lines, this deviation from pedantry probably gains as much in spontaneity as it loses in uniformity and precision.